Welcome to the Zva Creative July Blog Hop, I'm the start of the hop this week! Hidden along the hop are FIVE Zva Creative prize packages, so it's important to leave a comment on as many blogs as you can along the way. Winners will be randomly chosen after the hop is over. Inspired by the sketch at Stamping Sensations and the Bo Bunny July Card Challenge, I used the Wedding Blessings stamp set from Our Daily Bread Designs, paper from the Bo Bunny Garden Collection and Flowers and Crystals from Zva Creative to create my card. The sentiment is stamped in Black Archival on a scrap of Bo Bunny pattern paper, then die cut with Spellbinders Circle Dies. 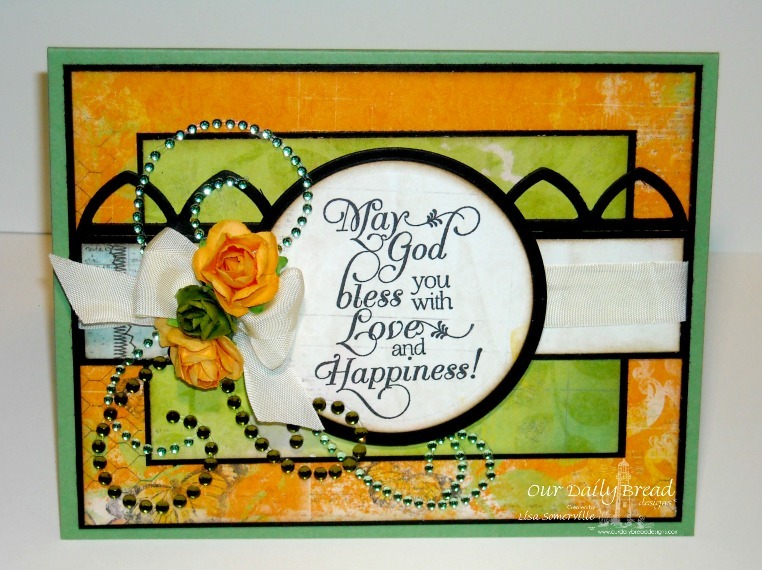 The border die is cut from Black card stock using Our Daily Bread Designs Cathedral Window and Border Dies. To embellish I added Zva Creative's Lime/Olive Crystal Flourish (CRS-06CA-107), Mini Roses in Olive and Orange, and a Seam Binding Bow. The Blog Hop runs through 11:59 EDT on Tuesday, July 30, 2013. Be sure to check back on Wednesday, July 31st, to see if you are one of the lucky Zva Creative Prize Package winners! The winners will be announced on the Zva Creative Facebook Page. Thanks so much for stopping by, your next stop is Christin's Blog! Our Next DT Blog Hop will be on Monday, August 26th! Oh, such a pretty color combo. Beautiful colors, sparkle and flowers....make a fab card! 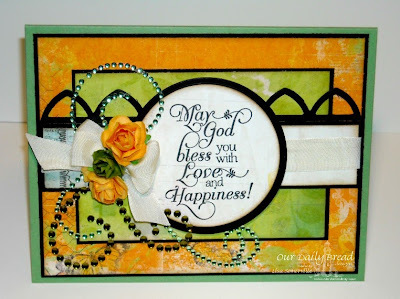 Delightful card creation ... lovely color choices! Great simple layout, and all the while making it a sparkling beauty. Thanks for sharing. Zva always has the perfect bling to compliment any project. This card is terrific. Gorgeous creation, thanks for joining Stamping Sensations and using my sketch, good luck. Love the color combination and all the bling. I'm looking forward to the rest of the hop too. Always so much fun. So pretty! I love these Zva hops! This is a gorgeous take on our sketch, Lisa! LOVE the colours and sparkle! Thank you for sharing it with us at Stamping Sensations this month. This is GORGEOUS! Saw you on the Stamping Sensations blog and HAD to come leave some love. Well done! Fabulous card - a great take on our sketch and gorgeous colours too! Thanks for joining us at Stamping Sensations!